​After my one month booktour in Germany and Switzerland (in eight cities) in 2015 and one month on booktour in the US last April (also in eight cities) I realized there is something new. In campus settings, Home was much more studied by Indonesianists, or Indonesianists-to-be, but bookstores, bookclubs, high schools, and art galleries are totally different settings. They read “Pulang"/Home as a work of translation based on reviews or recommendations from friends or book clubs. They are readers who have never heard of Indonesia. They got interested in the novel, then the culture, the history, the movies, the food (“PULANG/HOME” mentions a lot of Indonesian food), the place and finally the language. It is a long way, and it is not a “linguistic seduction” at first, but attraction through literature usually lasts a long time and it becomes an “eternal love”. Bahasa Indonesia –as opposed its roots—will always develop rapidly because of the nature of Indonesian, many ethnic groups and daily influences from their vocabulary that enrich Indoensian language (besides foreign languages like Arabic, Portugese, Dutch and English) and these developments are portrayed in our modern literature. ​Leila S. Chudori (1962) is one Indonesia’s leading writers and journalists. 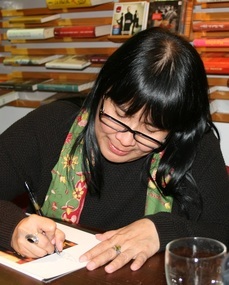 Her latest novel, Pulang or "Home" (2012), was translated by John McGlynn and has just been published in English by Deep Vellum (2015). "Home" is a literary breakthrough since it deals with the historical mass killings in Indonesia in1965. It won the prestigious Khatulistiwa Literary prize in 2013. "Home" has been translated into French (Pasar Malam, 2014), Dutch (De Geus, 2015); Italian (Atmosphere Libri, 2012), Germany (Weidle Verlag, 2015). Leila works for Tempo and has published two collections of short stories.